As much as I love summer, I can't help getting excited for autumn and back to school season. And even though I've validated all of my uni classes (MA thesis I'm coming for you!!! ), I just got a job as a high school teacher, which means I will actually go back to school in a few weeks, except I'll be on the other side of the classroom. With that in mind, I can't stop daydreaming about one of my favorite thing in the world: clothes. 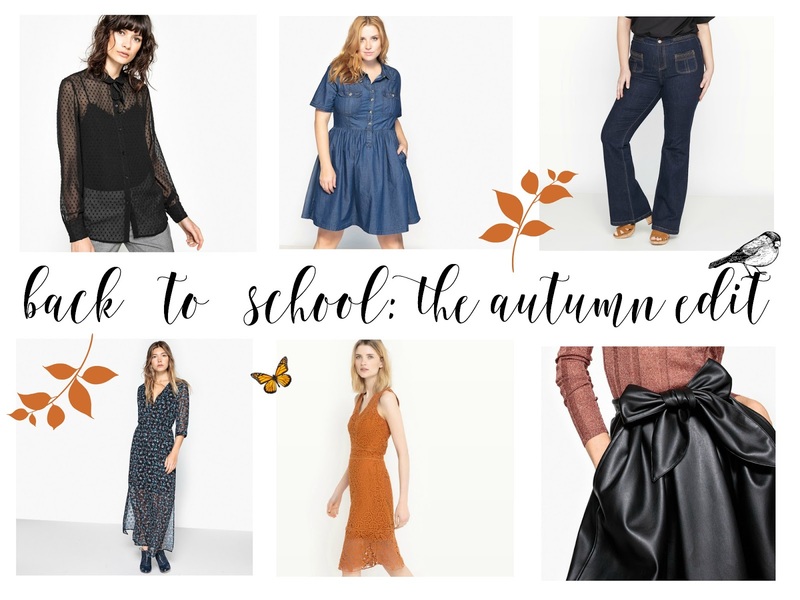 Especially since back to school season is, in my mind, always associated with a new Autumn wardrobe addition, whether it's a bag, a pair of boots, or a coat, that adds to the "fresh start" feeling of this time of the year. And if Asos and H&M have been my go-to shopping destinations for summery clothes, I'm currently obsessed with these pieces from La Redoute. I feel that most of these items would be work appropriate (at least in a semi-formal environment) and comfortable, while at the same time allowing me to express myself style wise, which are my biggest concerns when dressing for work. 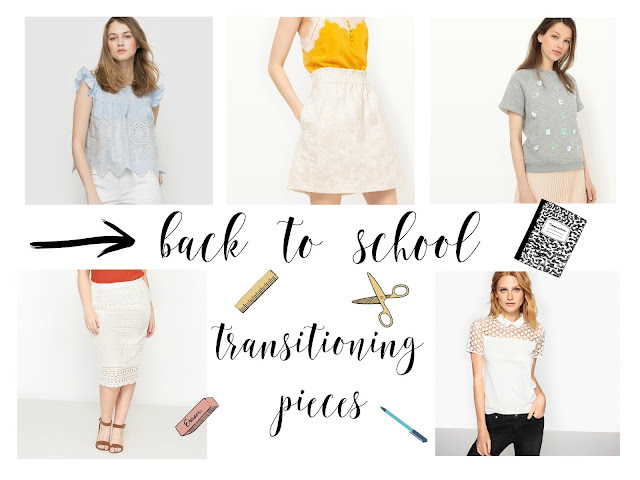 Broderie Anglaise Blouse: I'm totally obsessed with this trend and I can totally see this summery blouse transitioning really nicely into Fall with jeans, a leather jacket and sandals or loafers depending on the weather. Add a long, thick cardigan on top and you've got a cosy Winter outfit. Cream Pineapple Skirt: How cool is this skirt? And what a cute way to incorporate a fun, playful element into a more formal/work appropriate outfit! I would wear it with a denim shirt, or a plaid shirt, with or without tights and with ankle or knee-high boots. So versatile! Embellished Sweatshirt: I love embellishments of any kind and this short-sleeved sweatshirt would look super cute with black skinny jeans, trousers or even a midi skirt. Off-white Lace Skirt: For years I swore by skater skirts, but lately I've been really into pencil skirts as they look more put together and can be very flattering, even on curvy women. I would wear this one with a denim shirt for Fall, or a thick grey jumper for Winter. White Star Top: Another formal yet "fun" piece that could be worn with practically anything. Sheer Polka Shirt: Button down are my go to on days when I teach and I'm really tempted to add this one to my collection as it is quite plain, but the dots add an interesting detail and texture. Denim Shirt Dress: I feel like a denim dress is such a staple and a must-have. However, the ones I own are rather light and summery. This dark-wash one would be perfect all year round and the fact that it's a shirt dress make it work/office appropriate. Maxi Dress: Long dresses are something I associate with Summer and yet Fall collections regularly have beautiful maxi dresses that have a lovely 70s vibe. It might be time to buy one and dust off that wide-brimmed hat that's hanging on my bedroom wall... Maybe not for work though. Leather Midi Skirt: I love wearing skirts, but I avoid short ones whenever I'm teaching, as I don't want to worry about an unexpected Marilyn moment in front or twenty teenagers. Midi ones are a lot "safer" on that front and look more formal. One of my high school teachers was a great fashion sense and I remember her sporting a leather midi skirt very similar to this one. Edgy and chic: it's on the to-try list!